Dr. Mansour began his pre-chiropractic education at Cal State Fullerton where he studied the basic sciences such as inorganic chemistry, organic chemistry, biology, along with basic physiology and anatomy courses. After completing his study there, he was accepted at Cleveland Chiropractic College in Los Angeles, California. During his four years at CCCLA, courses included biochemistry, a major emphasis on anatomy and human physiology, X-ray, diagnosis, chiropractic adjusting techniques and patient care in the Cleveland Public Clinic. 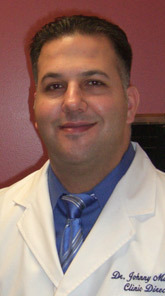 After graduating in 1998 Dr. Mansour returned to the Ontario area to establish his practice. Dr. Mansour is married to Nancy and they have two children, Adriana and Danny. “Enough about me! How can we help you with today’s safe and natural chiropractic care? If you have any questions, please call me or email me here and let’s arrange a time to explore your options.